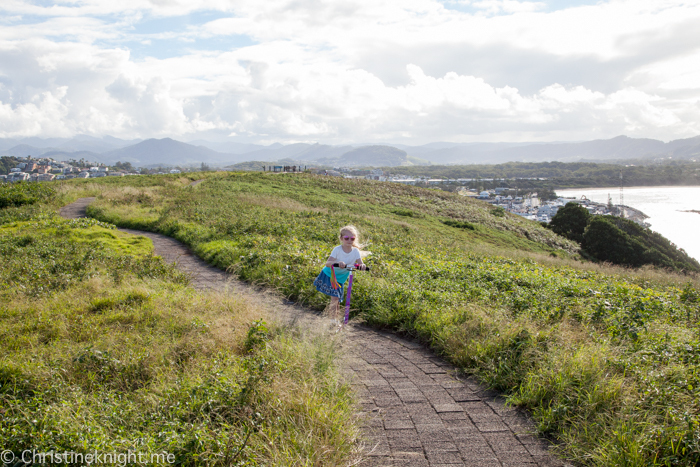 Coffs Harbour Archives - Adventure, baby! 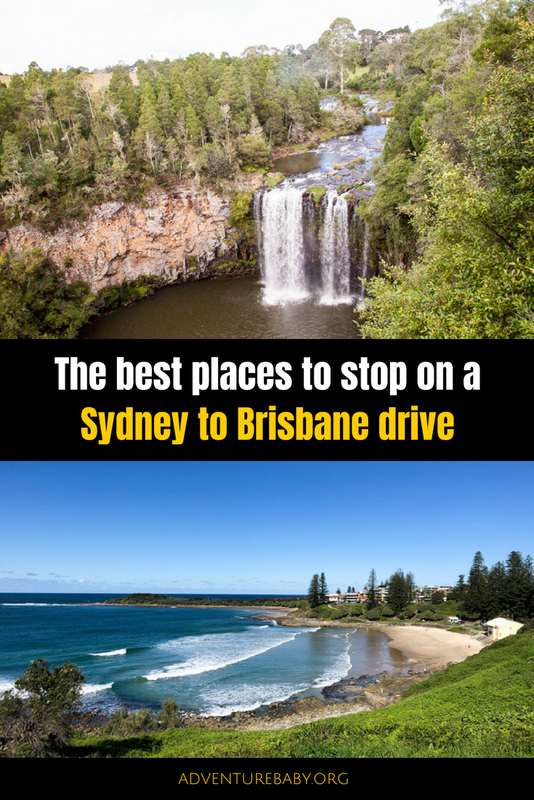 The iconic Sydney to Brisbane drive is a breathtaking 920km, or 10 hour, road trip past some of the most beautiful towns and peaceful beaches Australia’s coastline has to offer. 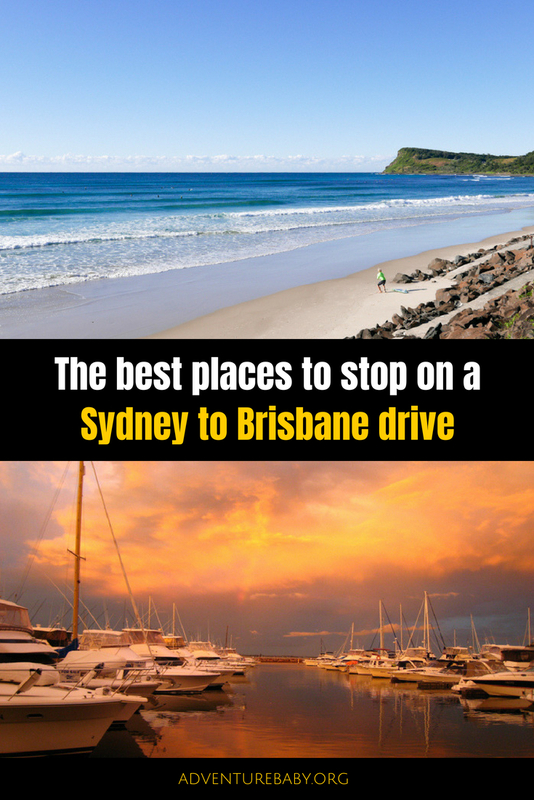 While you can do the drive in a single day, why not spread it out over a few days or even weeks, and soak up the pristine beaches, delectable cafes and fascinating history that is on offer throughout the Sydney to Brisbane road trip. The Central Coast is only an hours drive north of Sydney, and is home to beautiful beaches and delightful cafes. Set aside a few days if you can to visit beaches and seaside towns like Copacabana, Macmasters Beach, Terrigal and Avoca Beach. We loved visiting the Australian Reptile Park in Gosford, and have often enjoyed the daily pelican feeding at The Entrance. Read more about things to do on the Central Coast here. The industrial and coastal city has so much to offer. 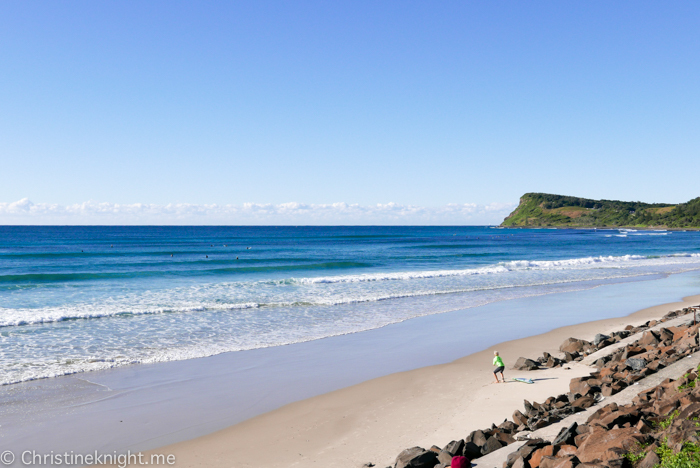 We love Newcastle’s gorgeous beaches, delicious cafes and stunning ocean baths. 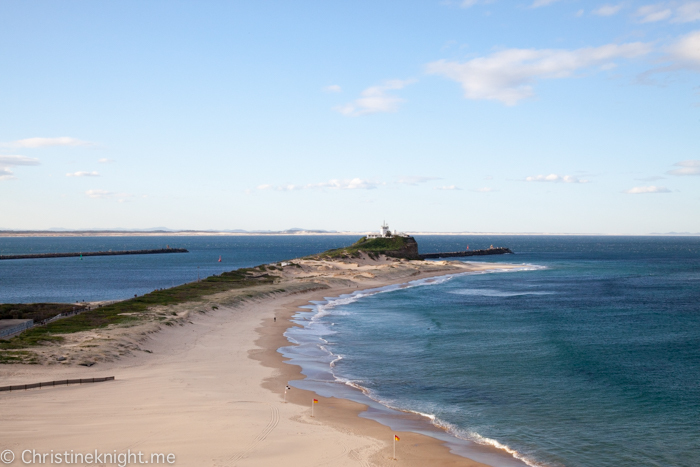 You can also visit historic Fort Scratchley, the Newcastle Museum and Nobbys Lighthouse. Read more about things to do in Newcastle here. 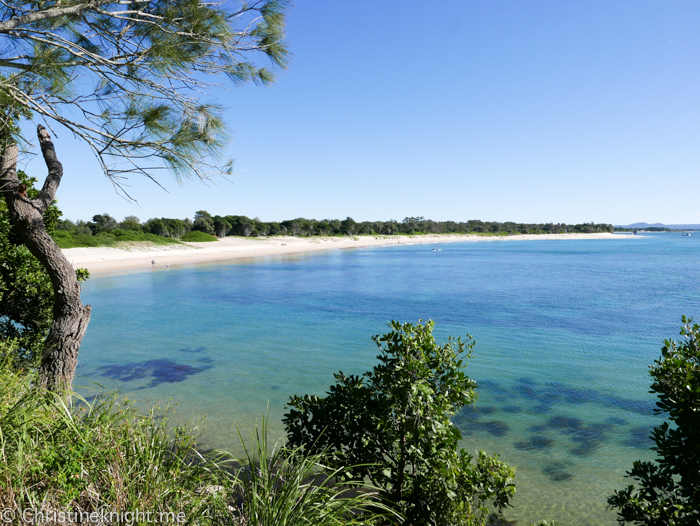 Located 2 1/2 hours drive north of Sydney, the area has a stunning 26 beautiful beaches and bays to explore. 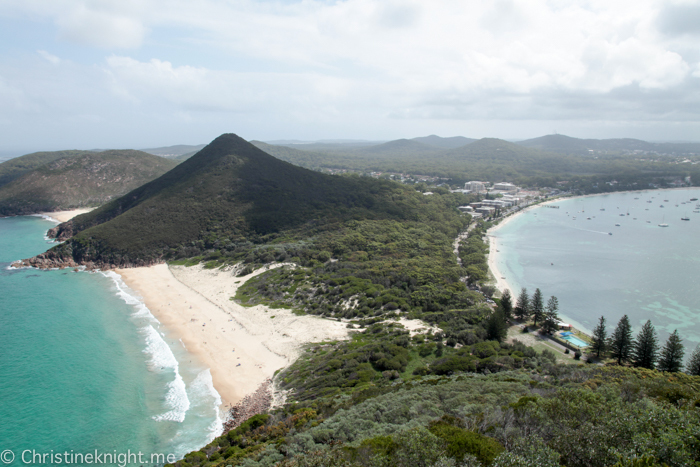 Port Stephens is renowned for whale and dolphin watching, sand dunes and gourmet restaurants. Read more about things to do in Port Stephens here. 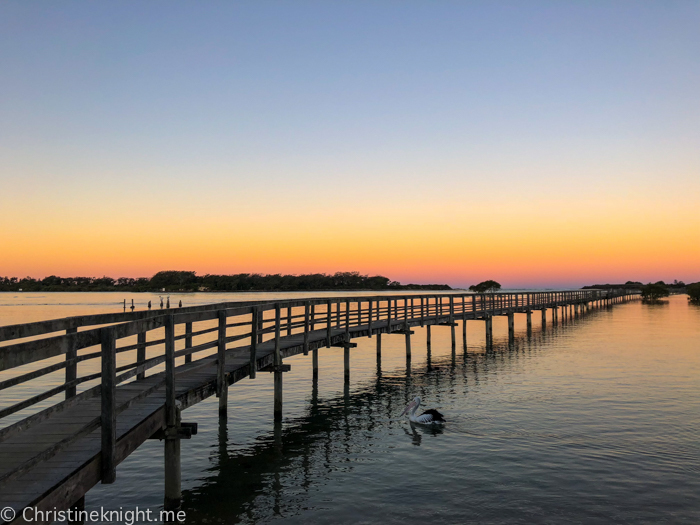 Located four hours drive north of Sydney and six hours south of Brisbane, Port Macquarie is a seaside town at the mouth of the Hastings River. It’s a gorgeous spot to spend a few days enjoying the beaches, wildlife and penal colony history. 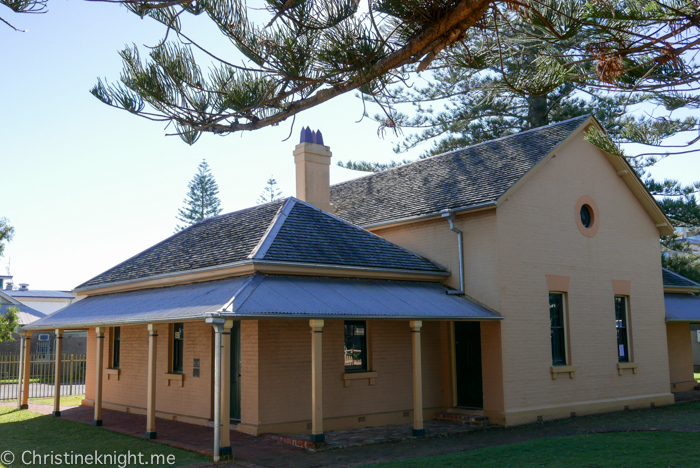 Visit the Port Macquarie’s Historic Courthouse that was built in 1869 and is located in the town centre. Read more about historic and cultural attractions in Port Macquarie here. We loved the colourful graffiti rocks on the break wall that stretches down to the very popular Town Beach. Along the walk we spotted plenty of dolphins frolicking in the bay. 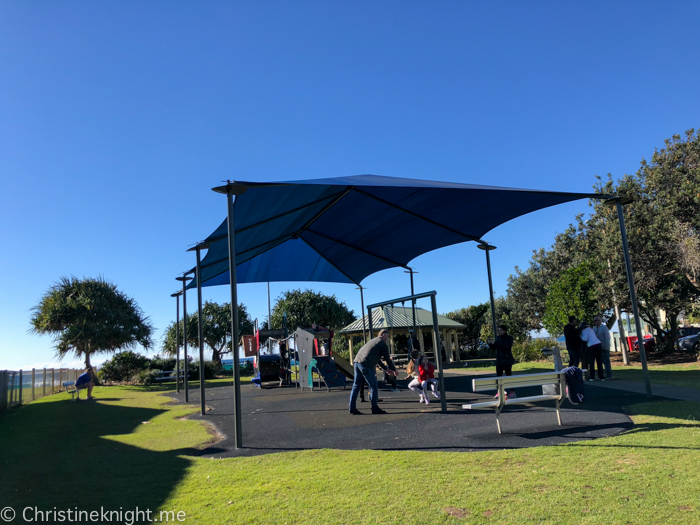 Town Beach has modern bathroom and shower facilities, grassy areas, picnic facilities, a skate park, kiosk, an outdoor gym and a modern playground. We also loved Mrs York’s Garden, a peaceful spot with lovely water views. Read more about Mrs York’s Garden here. 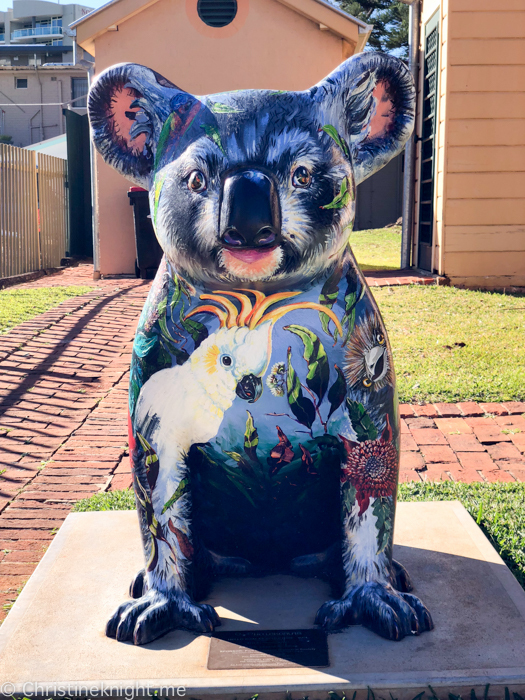 Other popular attractions in the area include the 19th-century Tacking Point Lighthouse, whale watching, Billabong Zoo, the Koala Hospital and the hand-painted giant koala sculptures on the Hello Koalas Sculpture Trail. Dining at the Pancake Place is an absolute must. They serve up delicious pancakes and crepes for breakfast, lunch and dinner! 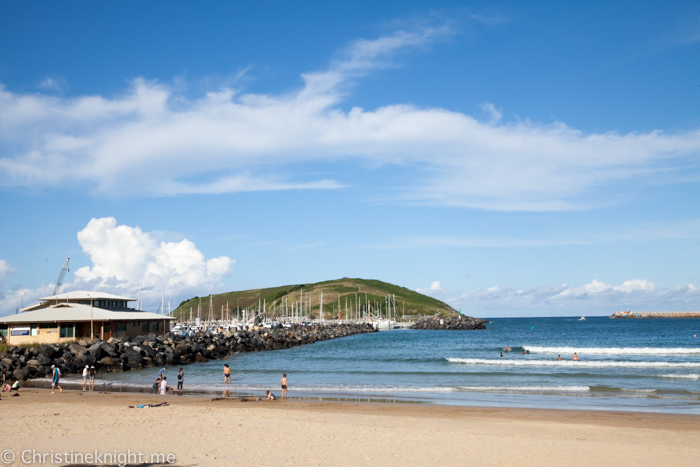 Coffs Harbour is halfway between Sydney and Brisbane, making it a popular stop on the quintessential coastal road trip. 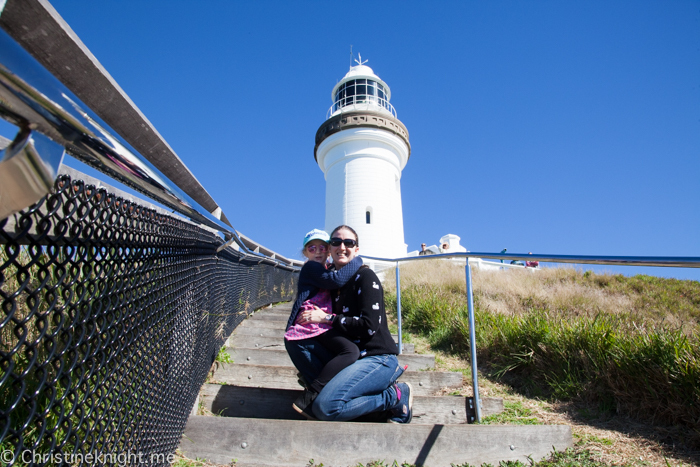 While the mid north coast town might be just a convenient place to stay a night or two for those making the longer journey, we were pleasantly surprised to find so many things to do in Coffs Harbour, and would recommend it for a holiday destination. 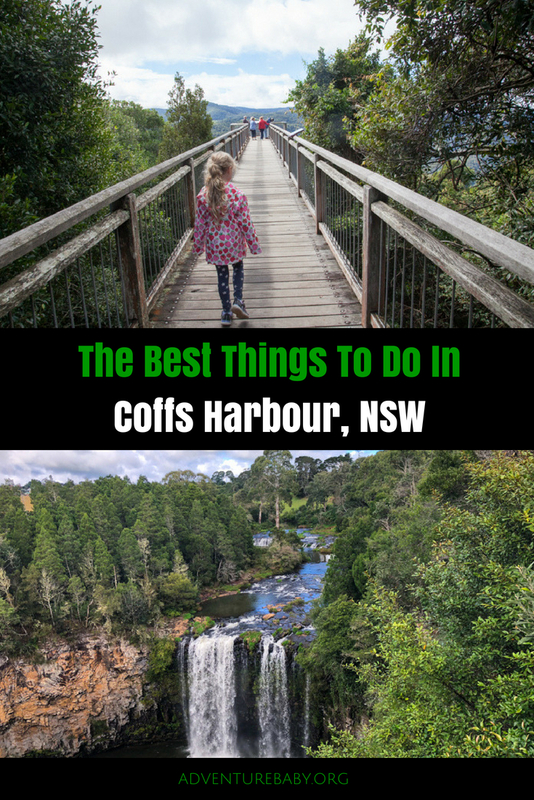 Read more about things to do in Coffs Harbour here. 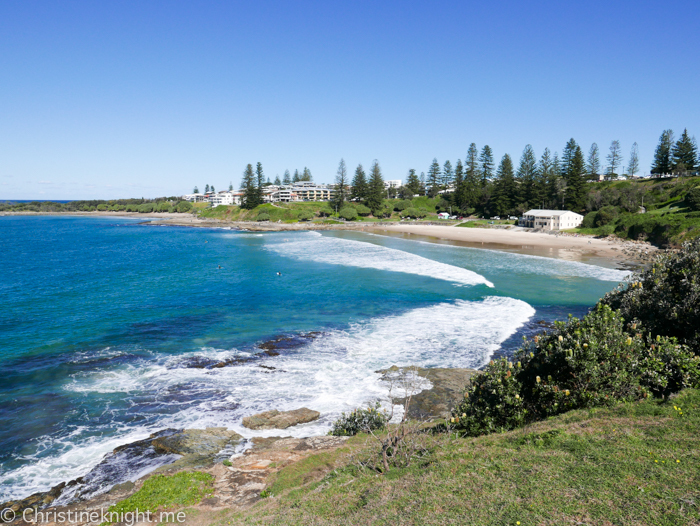 Around 7.5 hours north of Sydney and 3 1/4 hours south of Brisbane, Yamba is a quiet little gem with beautiful beaches, fresh seafood and stunning national parks surrounding it. 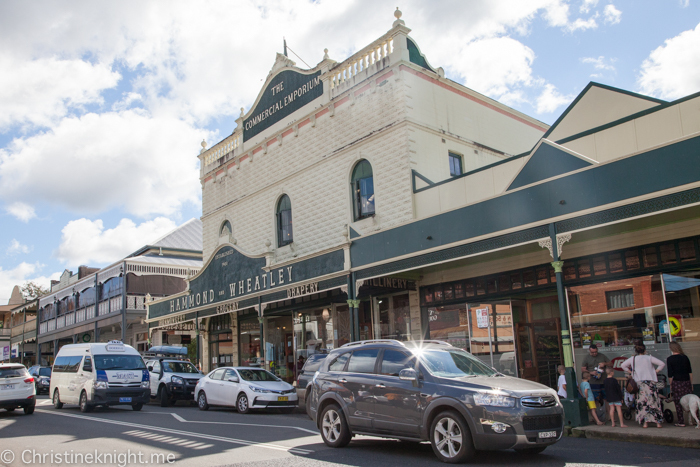 We loved the chilled out vibe in this little seaside town and its excellent cafes. Take a dip in the usually calm waters of Main Beach, or try the ocean pool at its south end if the waves are choppy. Stroll up a bit further to Turner’s Beach where you’ll find a rock shelf and the South Break Wall, plus a path and steps that lead up to the Lighthouse. We spotted pods of dolphins in the water from the break wall. The Lighthouse, built in 1955, offers gorgeous views up and down the coast. Located roughly 8.5 hours north of Sydney and 2 hours south of Brisbane, Ballina is an old school seaside town that’s a great base for exploring the local attractions. Check out the local beaches, take a river cruise or enjoy a kayaking tour if you like being on the water. 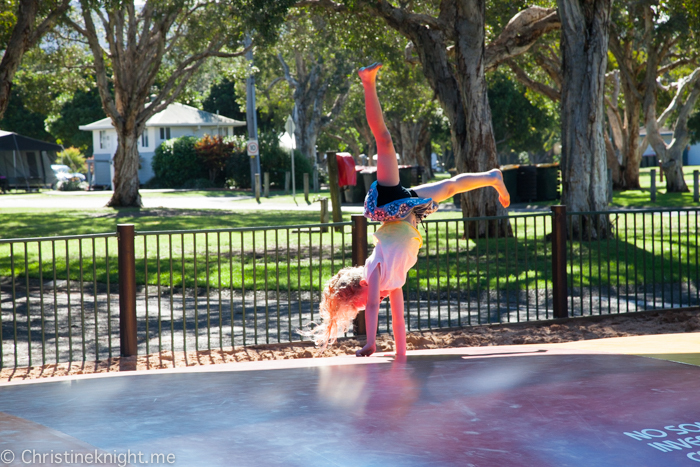 The town is close to Broadwater and Bunjalong National Parks for nature-lovers. 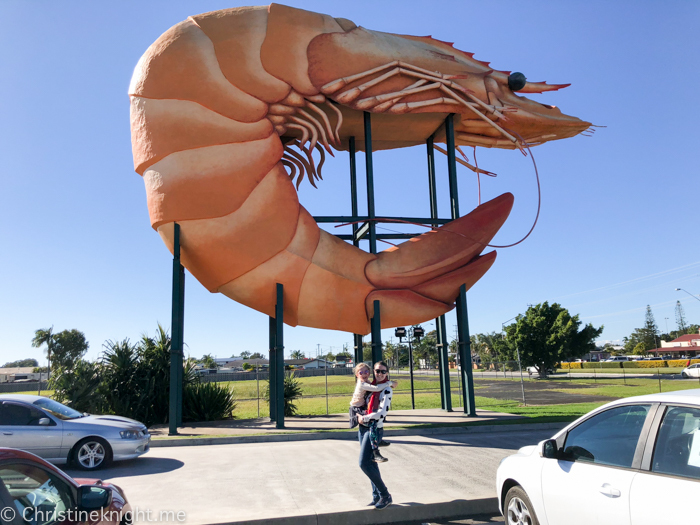 We highly enjoyed Ballina’s Big Prawn, which was built in 1989 and given a $400,000 makeover in 2013. It’s located adjacent to Bunnings Warehouse in River Street. 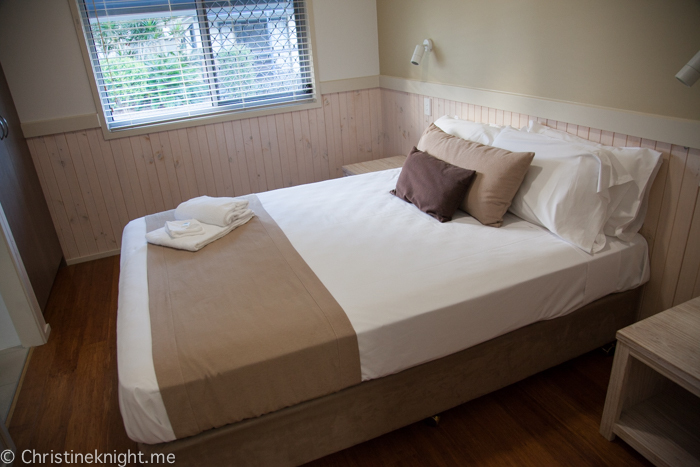 While in Ballina we stayed at the Ballina Homestead Motel and highly recommend it. 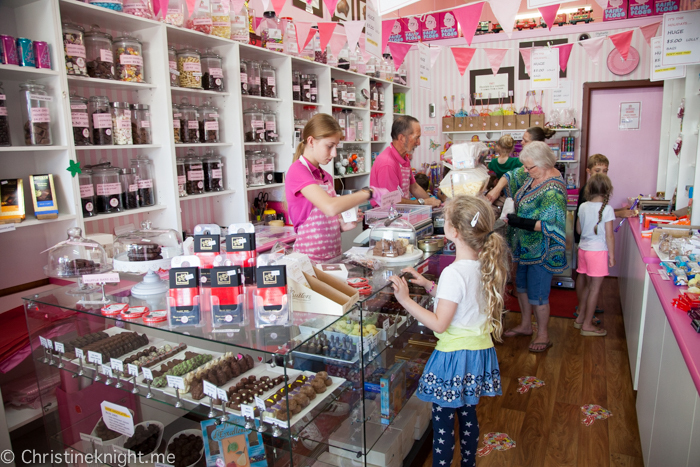 Read more about things to do in Ballina here. 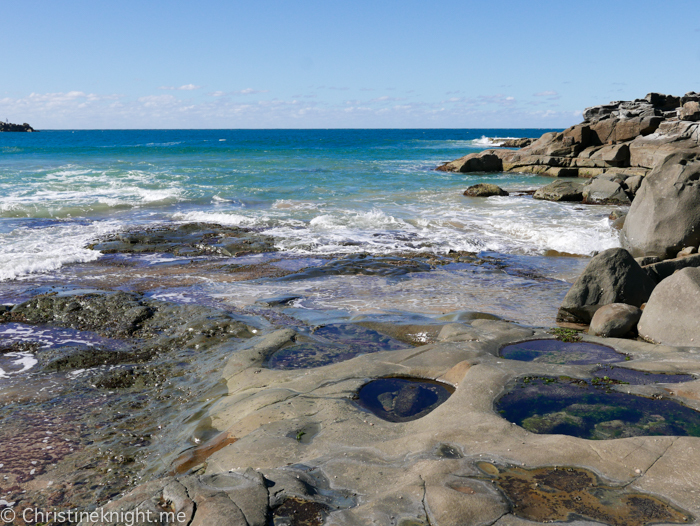 A 10 minute drive north from Ballina is Lennox Head, a charming little seaside village with oodles of charm. We loved the beautiful 7 Mile Beach and strolling the main street with its boutiques and cafes. 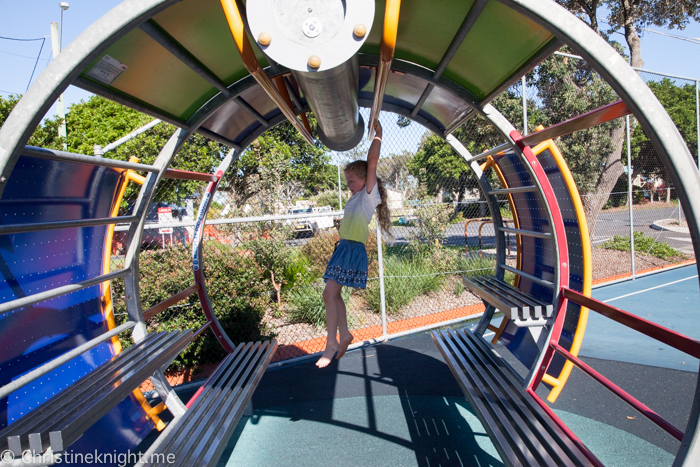 There’s a great playground for kids in the park near the beach. 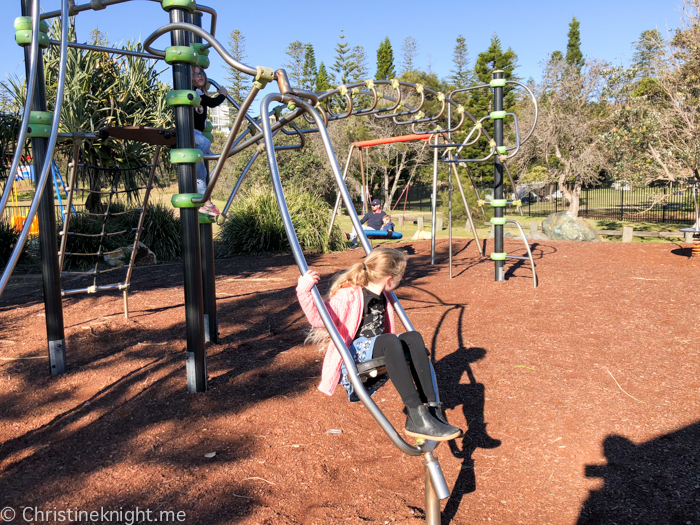 We enjoyed the most delicious Italian dinner at the supremely kid-friendly Quattro Classic Lennox Head and homemade gelato from gelato from Lennox Gelato & Coffee Co. They had chilli gelato on the menu but we weren’t game to try it! 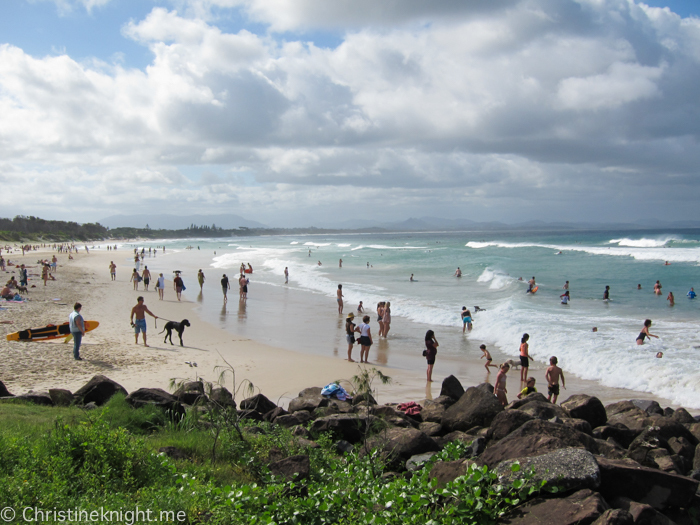 8.5 hours north of Sydney and 2 hours south of Brisbane lies the ever-popular Byron Bay. Once a hippy town Byron has of late attracted more of an upmarket, hipster clientele, and the hotels, restaurants and shops have started to reflect the new visitors. The vibe is still relaxed, but the town has started to get a whole lot trendier! Byron Bay has plenty of natural attractions on offer, including stunning beaches included Main Beach, Clarkes, Wategoes and Little Wategoes. The later is Australia’s easternmost beach. 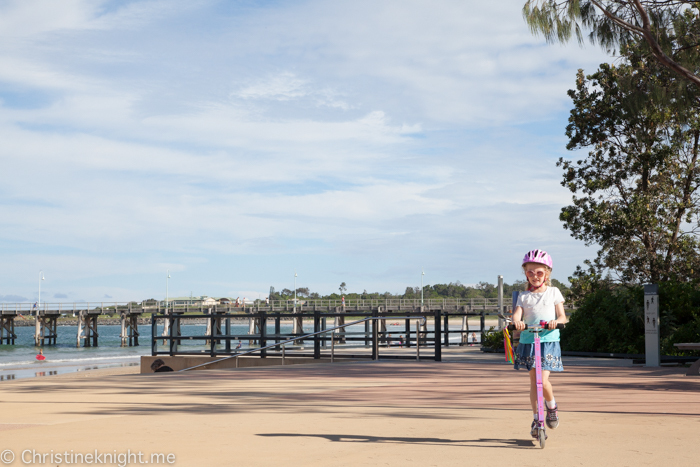 Main Beach has an excellent playground for kids. 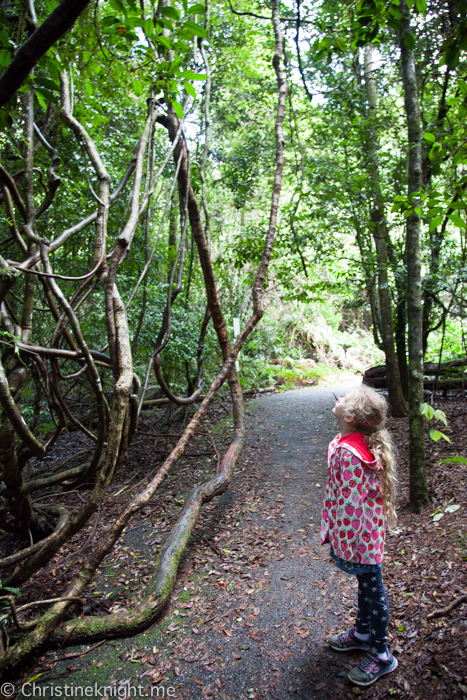 There are also plenty of bushwalks in hinterland rainforest, coastal trails and loads of wildlife to spot. We love visiting Cape Byron, the easternmost point of the mainland of Australia and home to Australia’s most powerful lighthouse. 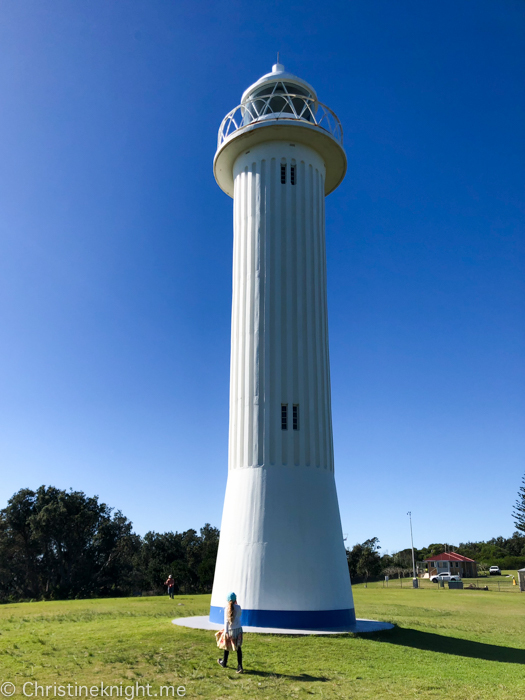 Take the easy 4km Byron Bay Lighthouse walk (parking is available if you prefer to drive) and look out for marine life in the Cape Byron Marine Park below. Dolphins, turtles, rays and whales can all be spotted – we were lucky enough to see a few whales. The Cape Byron Lighthouse and lighthouse keepers cottages were built in 1901. Light food and drinks are available. We highly enjoyed dining at Bayleaf Cafe, which really embodies how far Byron has come and what its future might hold. 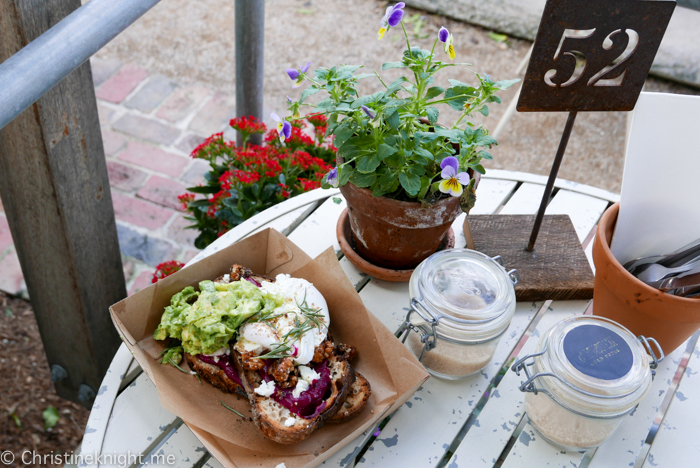 Delicious, fresh food, beautifully prepared and creatively presented, in a buzzy cafe with open windows and tables spilling out onto the footpath. To get a real feel for the spiritual side of Byron Bay, visit the Crystal Castle and Shambhala Gardens. 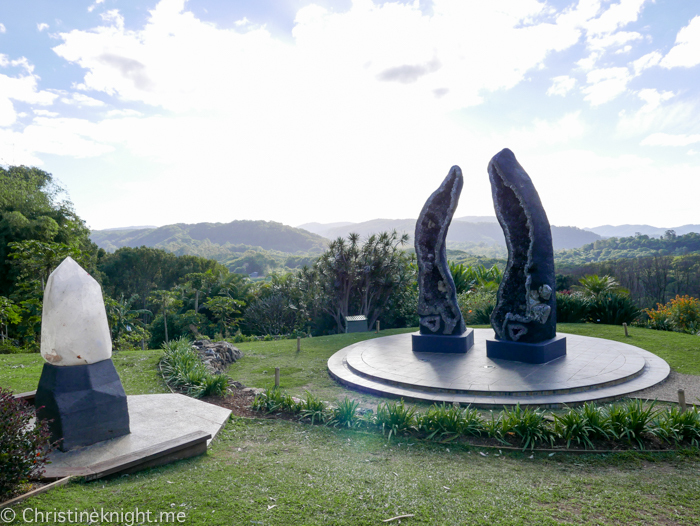 The gardens are speckled with the beautiful crystals and statues that pay tribute to various spiritualities around the world, including the largest stone Blessing Buddha in Australia. Our daughter loves crystals, so we visited to see the world’s tallest geode pair. We really enjoyed the gardens but thought it was an extremely expensive outing for what it was. We found the accommodation in Byron Bay to be double the price of neighbouring towns, so opted to stay in nearby Coolangatta instead. Queensland’s Gold Coast is a family-friendly stretch of coast lined with spectacular beaches, famous theme parks and lush hinterland rainforests. 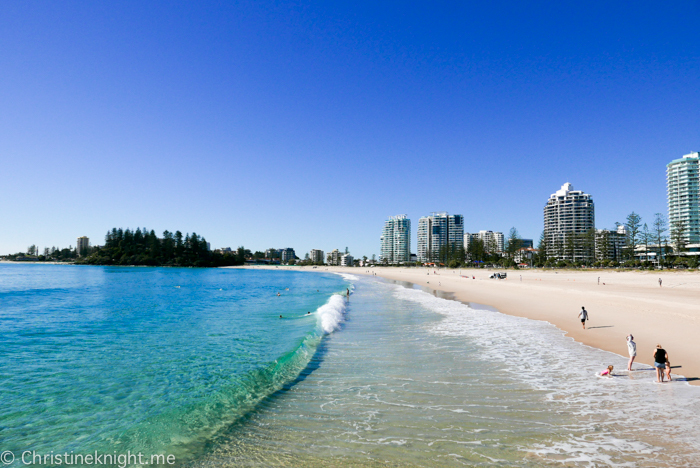 9 hours north of Sydney and 1 1/4 hour south of Brisbane, Coolangatta is the southernmost suburb of the Gold Coast, just over the NSW border. It was named after the schooner Coolangatta, which in 1846 was wrecked there. 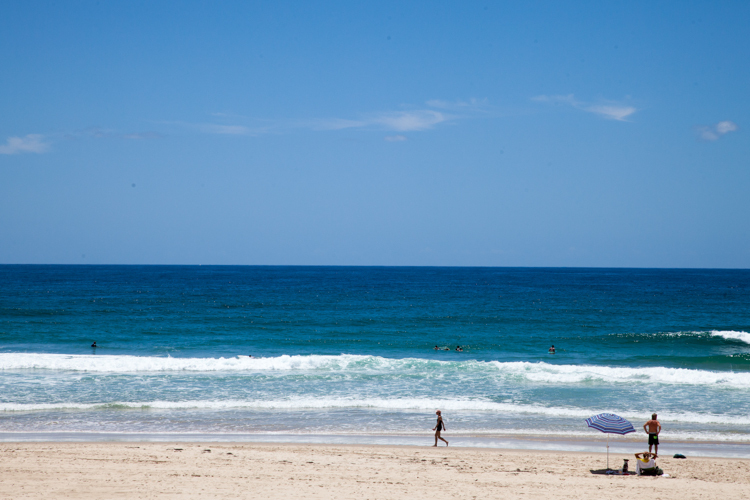 Coolangatta is only a short drive from Surfers Paradise but it feels like a different world. 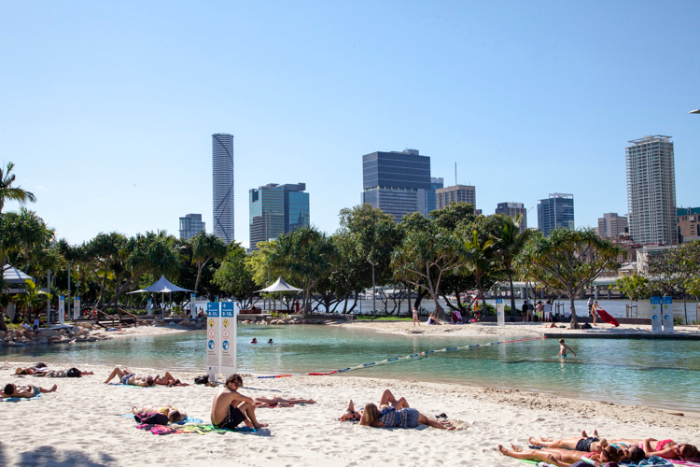 The town has a relaxed vibe to it and a stunning beach so that when combined with its excellent restaurants and hotels, makes for the perfect Gold Coast destination in our opinion. 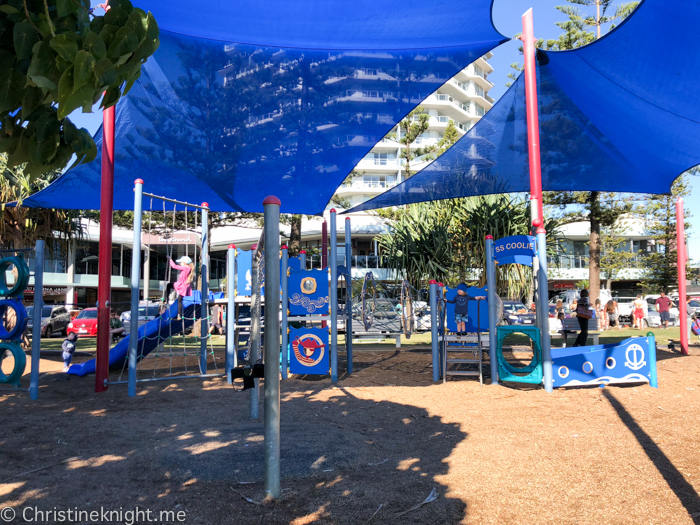 Kids will love the excellent, shaded playground just across from the main strip of restaurants and the wide path that runs along the beach for scooting. Sunset at Snapper Rocks is incredible. If you visit during winter you might see whales passing by like we did. We dined at O Sushi which had a huge variety of vegetarian and vegan dishes including haloumi skewers. Gelato Messina is not to be missed. 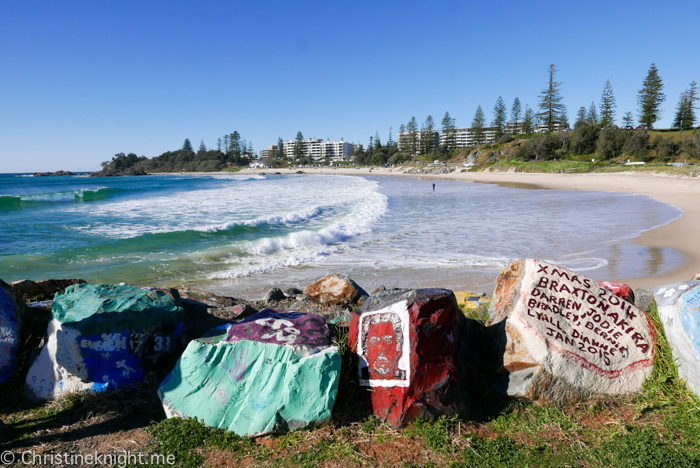 While in Coolangatta we stayed at the Greenmount Beach Hotel, which was an excellent budget find. Currumbin is famous for the beautiful Currumbin Creek waterway that offers sheltered conditions for swimming and watersports – Tallebudgera Creek is particularly popular with the locals. 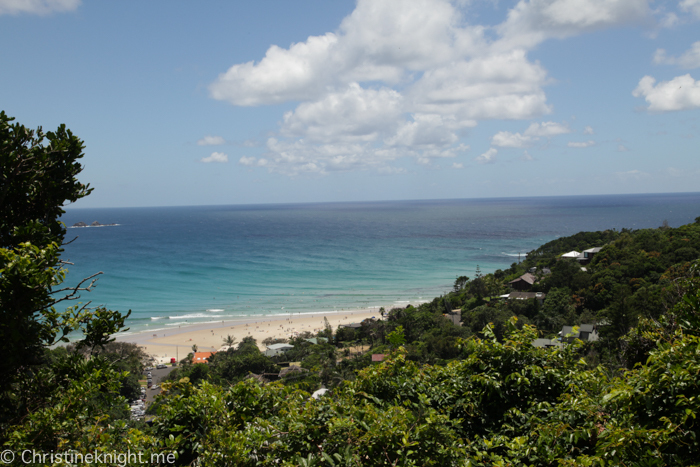 You’ll also find the Currumbin Wildlife Sanctuary in this peaceful beach suburb. 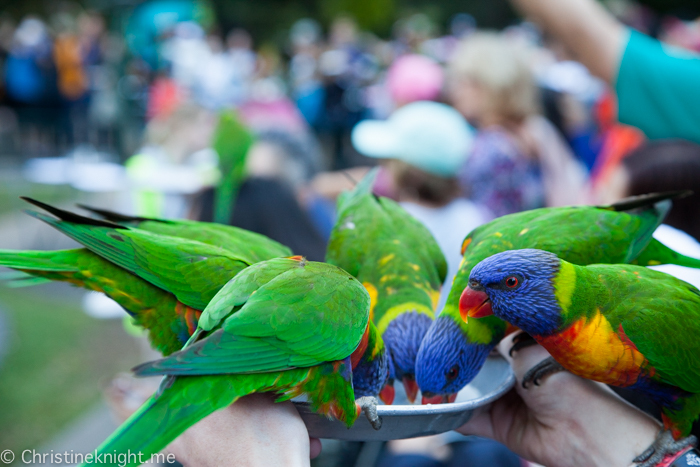 Arrive at8am to participate in their daily free lorikeet feeding. Read more about visiting Currumbin Wildlife Sanctuary here. The relaxed vibe in Burleigh, as the locals call it, gives it an entirely different feel to its neighbouring beaches to the north. While you can see the Surfers Paradise high rises in the distance, it feels like a whole world away. The beach is protected and calm, making it popular with families. 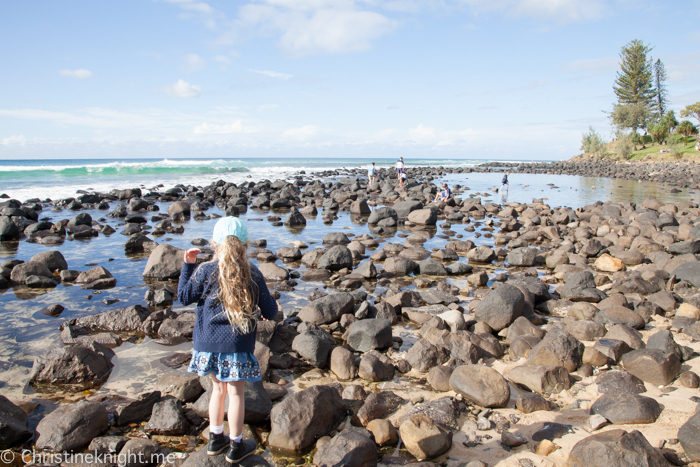 We loved climbing rocks and trees at the south end and sitting on the headland and watching surfers showing off their moves. 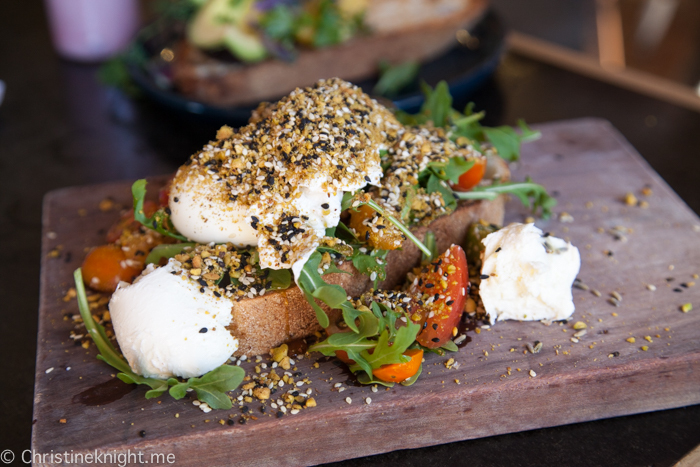 We dined at the excellent Paddock Bakery in the neighbouring suburb of Miami. 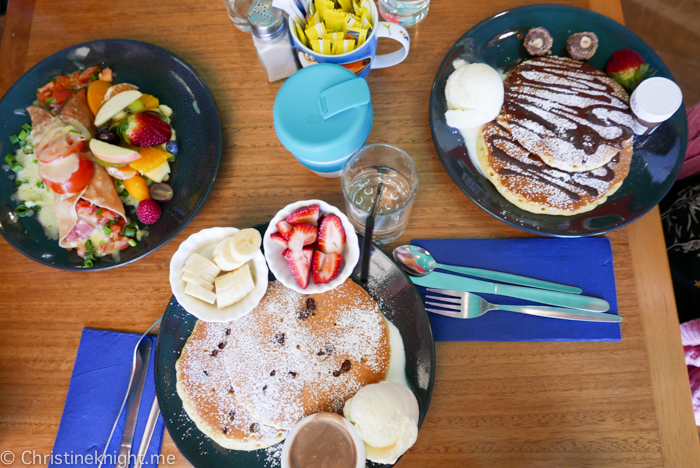 With its relaxed vibe and pretty, tasty food, it’s an iconic Gold Coast cafe well worth the visit. Getting further into the bustling centre of the Gold Coast, Broadbeach has a wide variety of cafes, restaurants, boutiques and accommodation choices, with a family-friendly vibe. 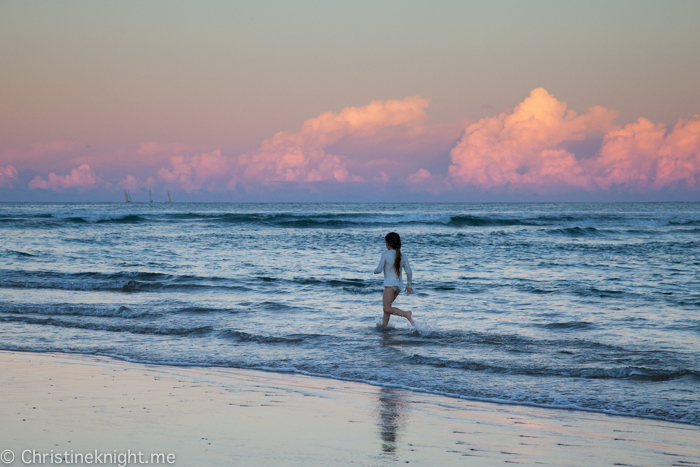 It’s a great base for a Gold Coast holiday if you’re after plenty of things to do and see. Broadbeach also has a beautiful beach, large playground for kids, and the Pacific Fair Shopping Centre. 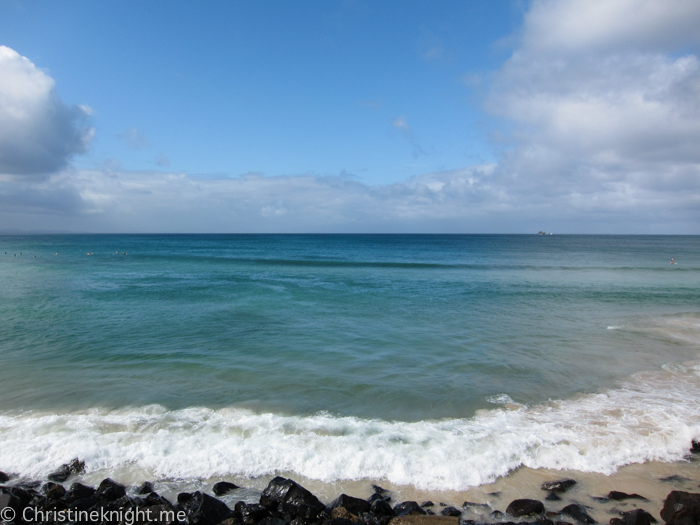 We stayed at the Crowne Plaza Surfer Paradise, which was located halfway between Broadbeach and Surfers Paradise. 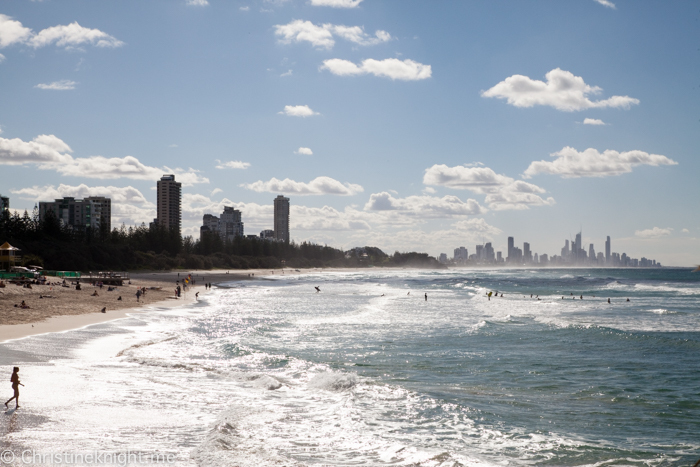 Read more about our stay at the Crowne Plaza Surfers Paradise here. Surfers is a hotspot for tourists visiting the Gold Coast. The iconic Surfers Paradise Beach and its sign draw in overseas visitors while the nightlife attracts school leavers. 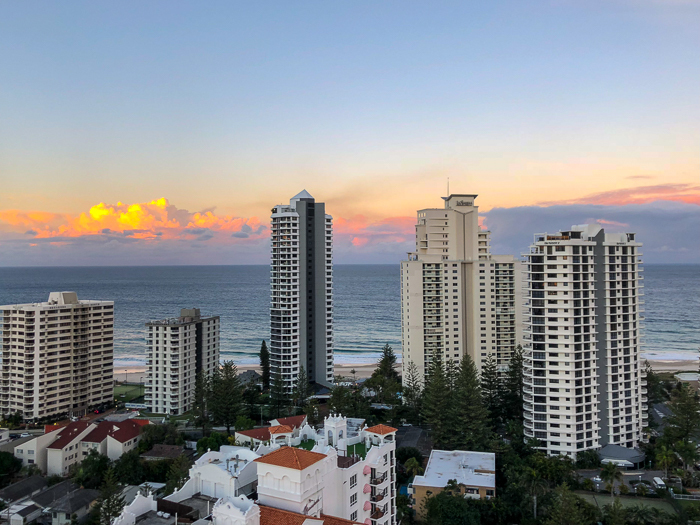 There are loads of attractions in Surfers Paradise that make it a great spot to stay if you’re keen to do and see the sights, especially with older kids. Attractions include SkyPoint Observation Deck, Infinity Attraction, Ripley’s Believe It Or Not and Timezone. Surfers Paradise is also where you’ll find all of the Gold Coast’s theme parks. 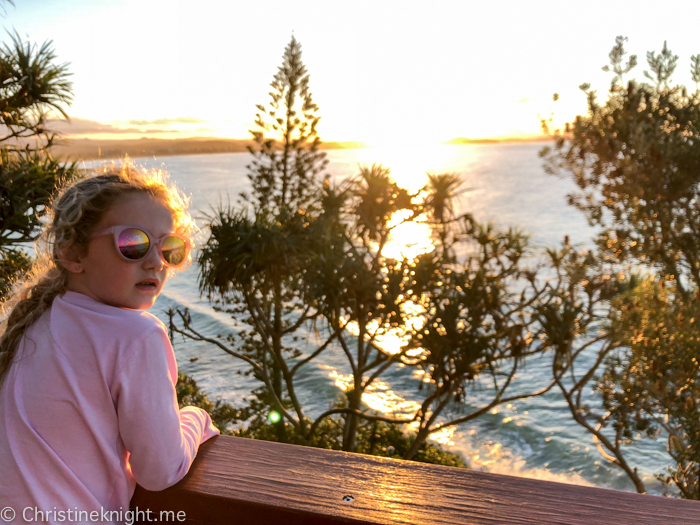 Read about things to do on the Gold Coast with kids here. 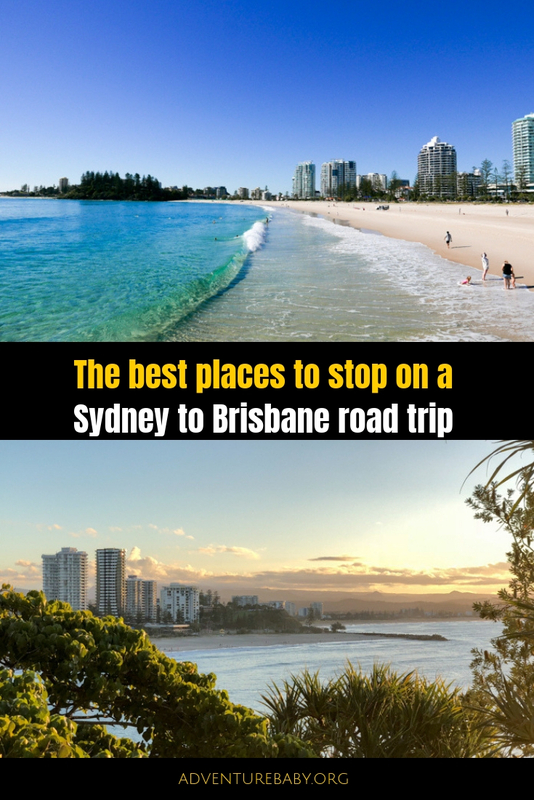 The Sydney to Gold Coast drive is one of our favourite holidays trips to make, and often we will stop here rather than proceeding on to Brisbane. The Sydney to Gold Coast road trip is around 9.5 hours drive, or 848km. The capital city of Queensland, Brisbane is a 10 hour drive from Sydney. It’s a vibrant city, filled with art, music, restaurants, man-made beaches and the beautiful river that runs through the middle. In Brisbane, we stayed at the Novotel Brisbane, which we highly recommend. Read about our stay at the Novotel Brisbane here. 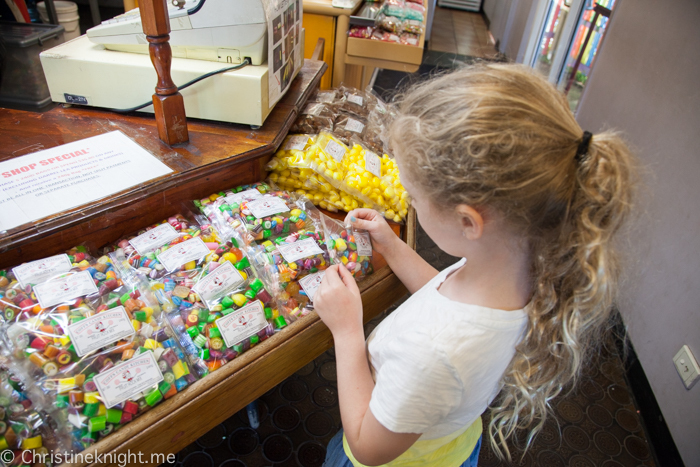 Read about things to do in Brisbane with kids here. And thats it! 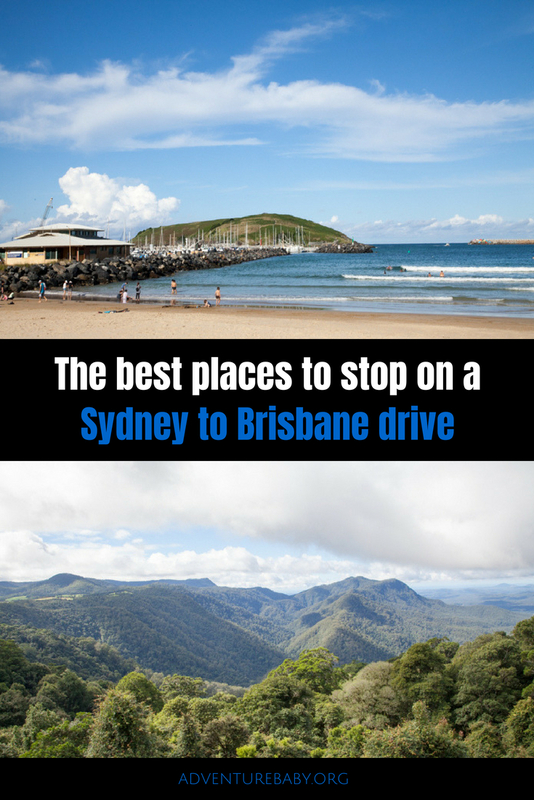 The Sydney to Brisbane drive is an epic journey through some of Australia’s most beautiful scenery. I highly recommend taking your time to see the sights along the way. 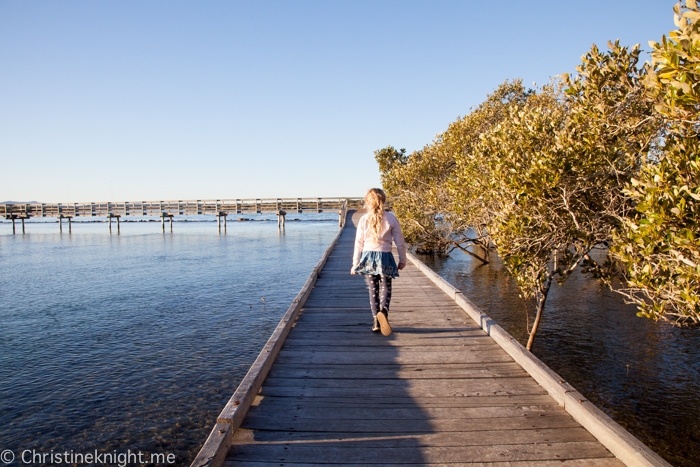 Take a stroll along the Jetty Strip. The path next to the beach and park area is cement, flat and great for scooting. There is also a range of cafes to choose from and a great gelato shop. 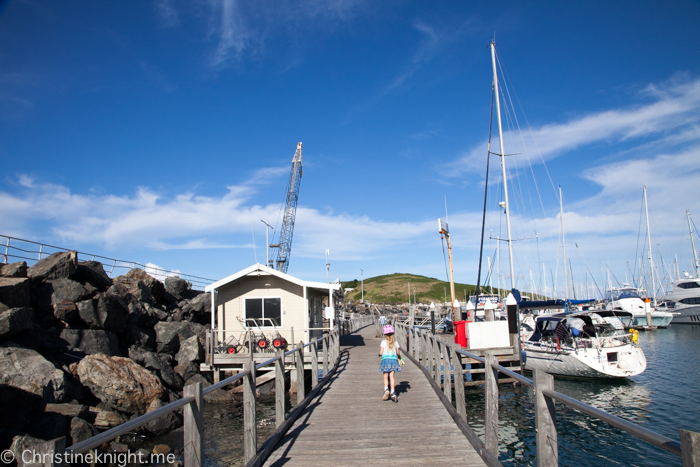 Wander around the jetty to see the incredible variety of sea life living in the harbour. We took very slow stroll along the jetty and spent a lot of time watching the fish swirl in the water beneath us. The perfect place for a swim, Jetty Beach is has calm water perfect for kids to splash around in. 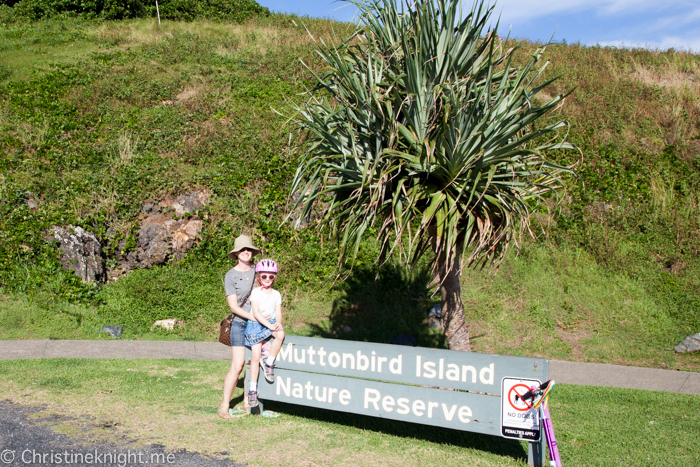 While we didn’t see any muttonbirds on the island we did enjoy the walk to to the top and far side of the island, where we were rewarded with beautiful views of the coast. Muttonbird Island Reserve is home to the wedge-tailed shearwater birds, their nests easy to spot as you walk around the island. We stayed right on Park Beach and loved walking down to the beach in the evenings to watch the sunset and paddle in the water. 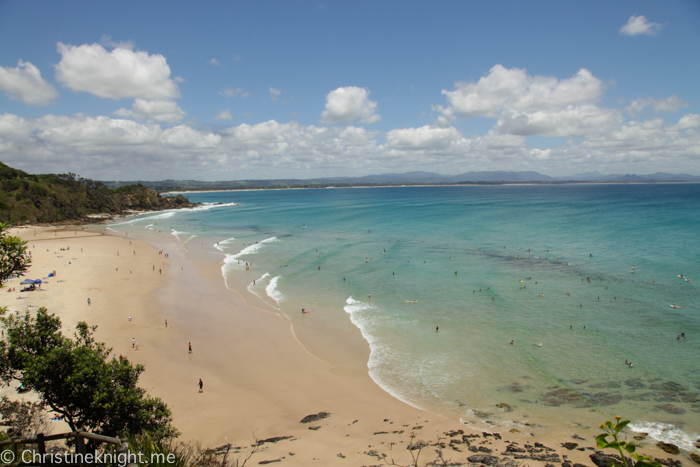 Coffs Creek runs through Park Beach, providing a nice current to swim down between two beaches. It’s possible to swim across the creek to the other side and continue walking up the beach to Coffs Harbour Jetty. It’s not an Aussie tourist attraction if there isn’t something big to photograph! 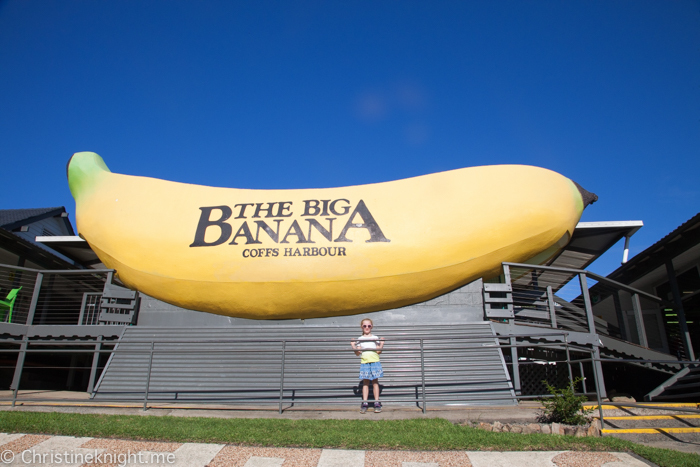 The Big Banana is a fun spot not just to pose for a photo, but also to enjoy one of the seven attractions it now boasts. Choose between the Water Park featuring four thrill slides and a kids’ aqua play area, a six-lane giant slide that’s the biggest slide of its kind in Australia, a 600m Toboggan ride, Laser Tag, Mini Golf, Theatre and Plantation tour, ice skating rink and Candy Kitchen, where you can see candy being made. Get more info on visiting the Big Banana Fun Park online. 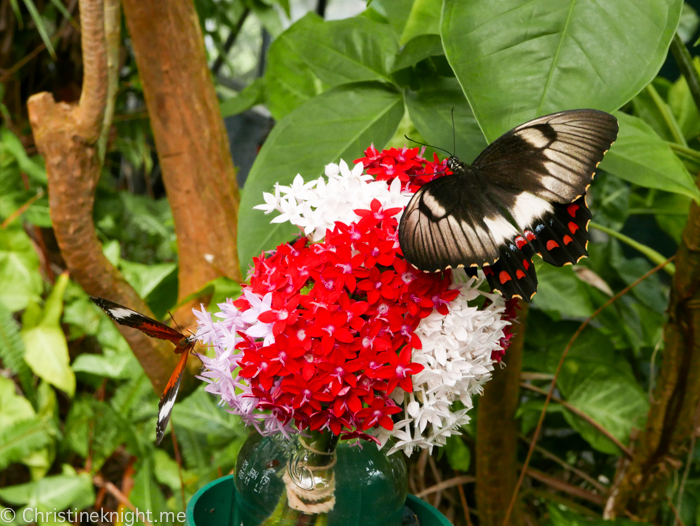 Step inside an aviary filled with hundreds of live butterflies. What an amazing experience to walk among these delicate creatures and watch them flutter, sip nectar and lay eggs. We even saw butterflies hatching from their chrysalis and had a few land on us. 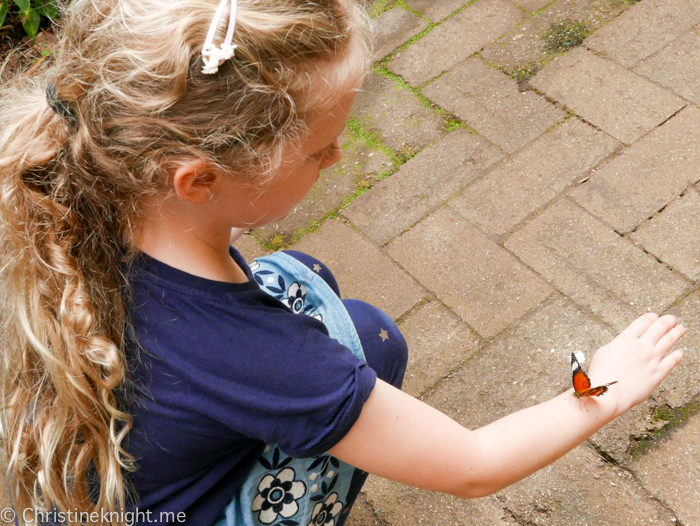 Tip: wear bright colours if you want to make friends with butterflies! The scones from the on-site cafe are amazing. Before leaving the Butterfly House, take a wander through the maze and see how quickly you can find your way out again. Get more info on visiting the Butterfly House online. This pretty little town is just south of Coffs Harbour. 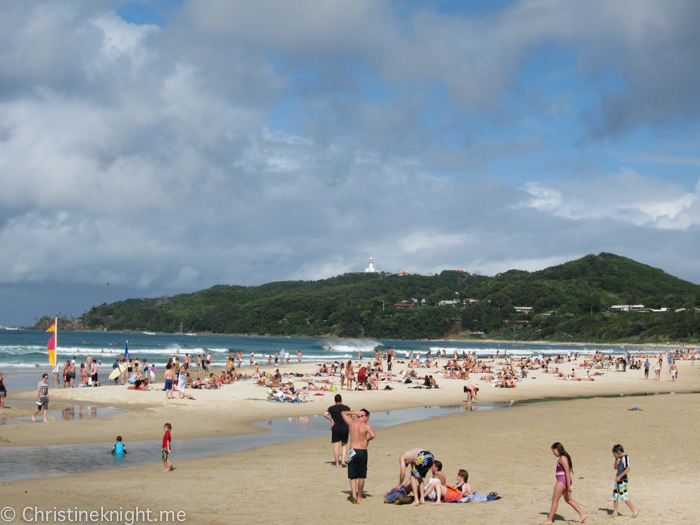 It has pretty beaches to explore, excellent cafes and is also right by the Bongil Bongil National Park. We loved dining at Treeo, recommended to us very correctly as the best cafe in the area. Excellent food and friendly staff made for the perfect cafe experience. 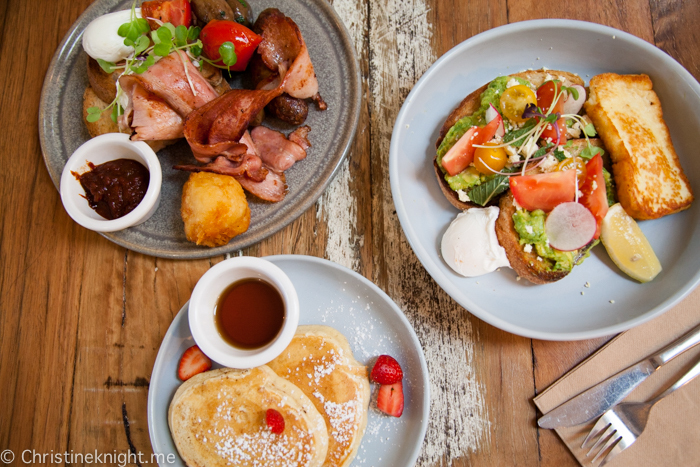 A 30 minute drive south-west of Coffs Harbour will bring you to Bellingen, a pretty little town filled with excellent cafes and boutiques. 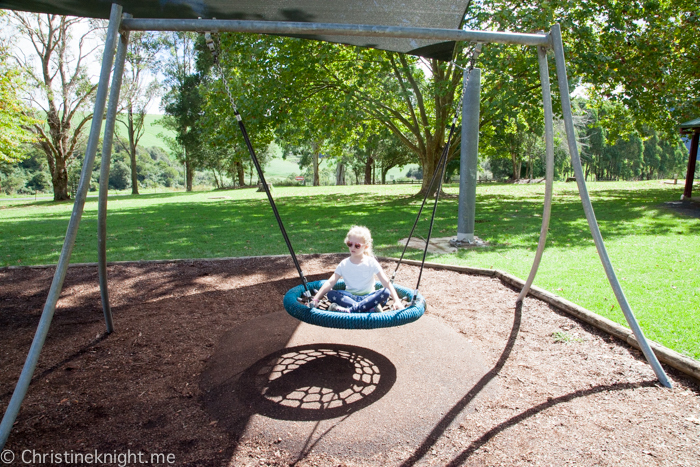 Bellingen likes on the Banks of the Bellinger River, which lends itself to plenty of water activities. Another 30 minutes past Bellingen, or an hour from Coffs Harbour, is the town of Dorrigo. 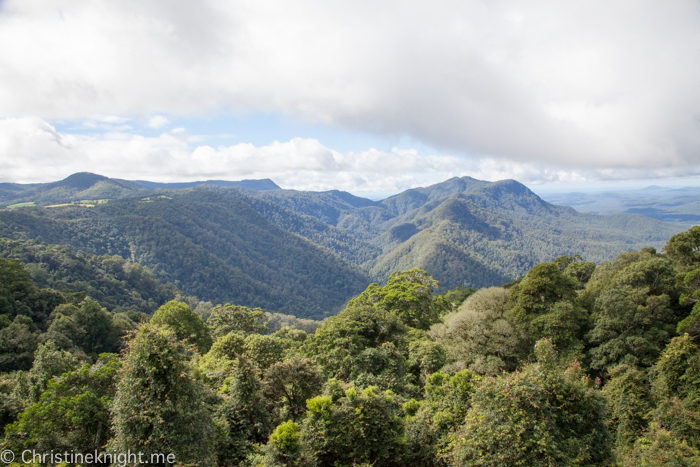 Dorrigo is home to the Dorrigo National Park, part of the Gondwana Rainforests of Australia World Heritage Area. It’s a stunningly beautiful rainforest with waterfall walks and a wide range of wildlife, including red-necked pademelons (they look kind of like quokkas), the regent bowerbird and wompoo fruit-dove. 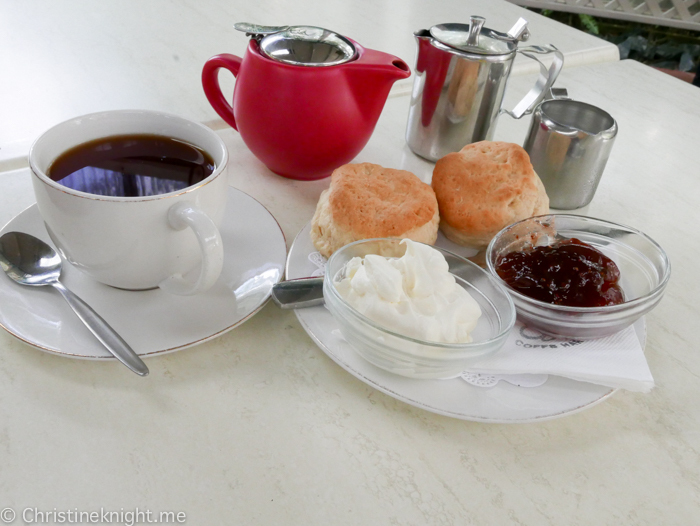 Start your visit to the Dorrigo National Park with a visit to the Dorrigo Rainforest Centre and Canopy Cafe. Staff at the Rainforest Centre will give you a map and tips on areas to explore. 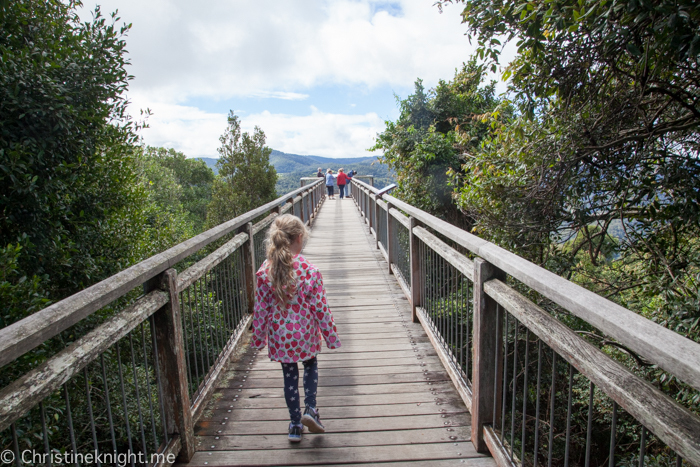 Before embarking on your bushwalking adventure, stroll out on the Skywalk, a 70m boardwalk through the treetops, 21 metres above the rainforest. 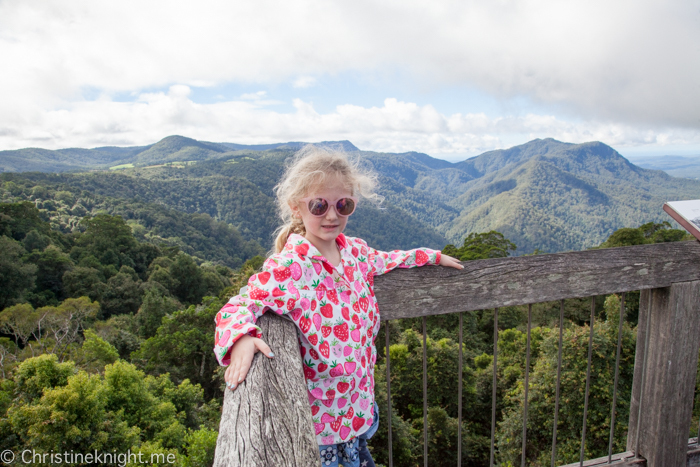 The view from the lookout at the end of the boardwalk is stretches over the Bellingen Valley and is just spectacular. 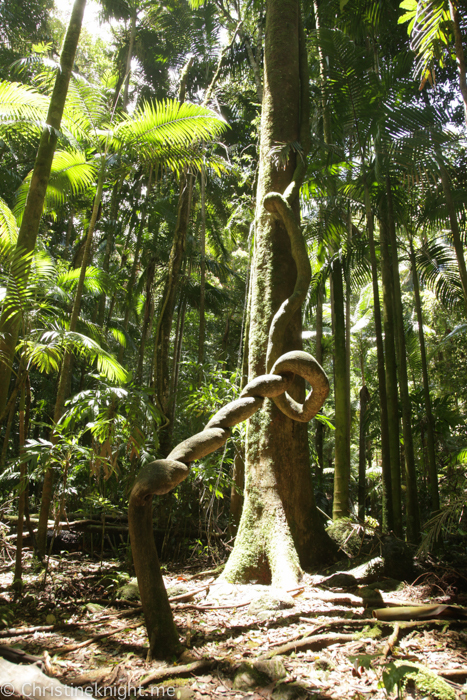 Get more info on visiting the Dorrigo National Park here. 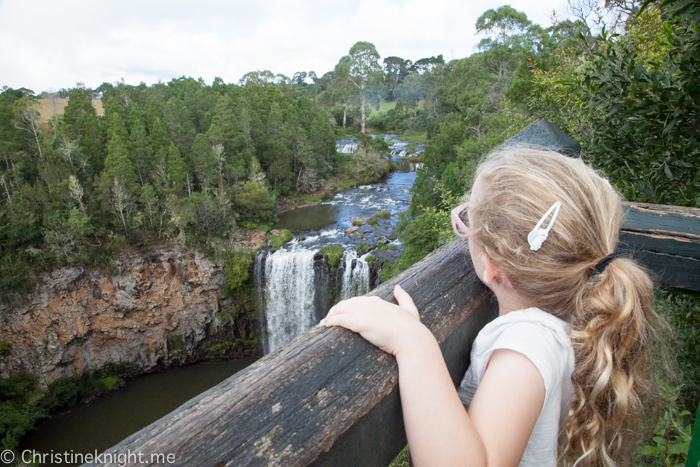 This 30-metre waterfall is a 2km drive north of the Dorrigo town centre. 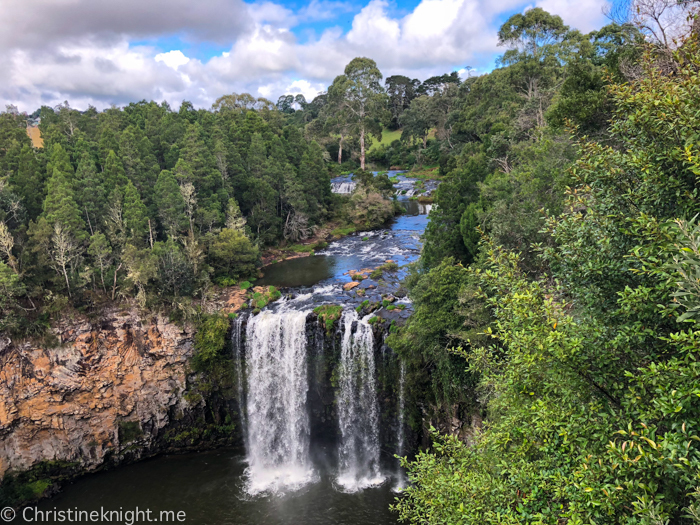 Dangar Falls is really a winner if you need a waterfall that is accessible without a long walk to reach it. The car park is right next to the viewing platform, making it the most easily accessible waterfall I’ve ever seen. There is a walking trail that leads to the river at the bottom of the waterfall if you’re feeling more adventurous. We stayed at the top and enjoyed the little playground before hopping back into the car. 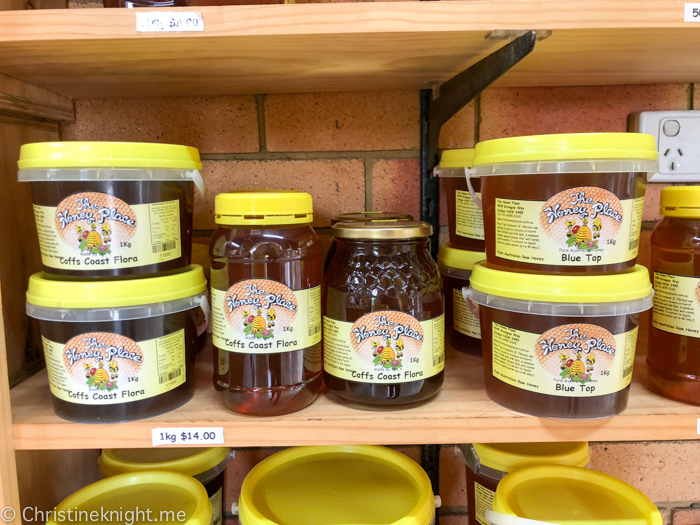 Located in Urunga, south of Coffs Harbour, The Honey Place is a delightful detour on your drive into or out of Coffs. 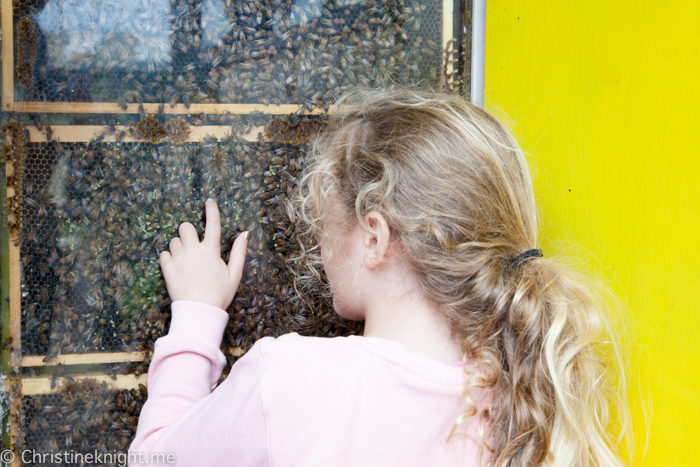 The glass display beehive lets you get as close as possible to a working hive with no risk of being stung. Friendly Australian native bees (non-stinging) also fly around the outdoor area although they were hiding on the day we visited. 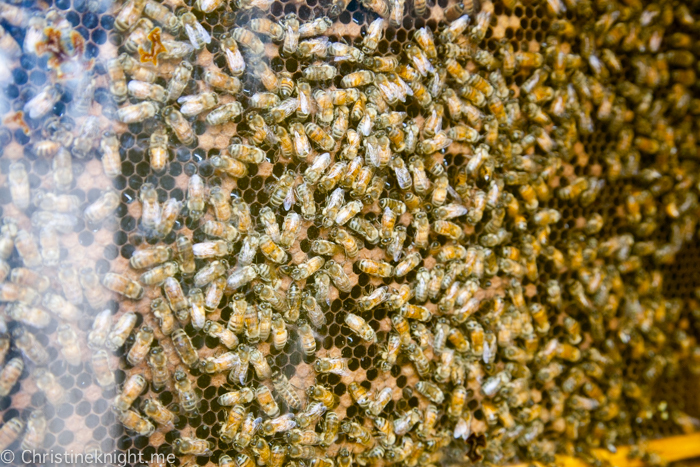 Try a range of locally made honey – it’s so good you’ll want to take it all home with you! 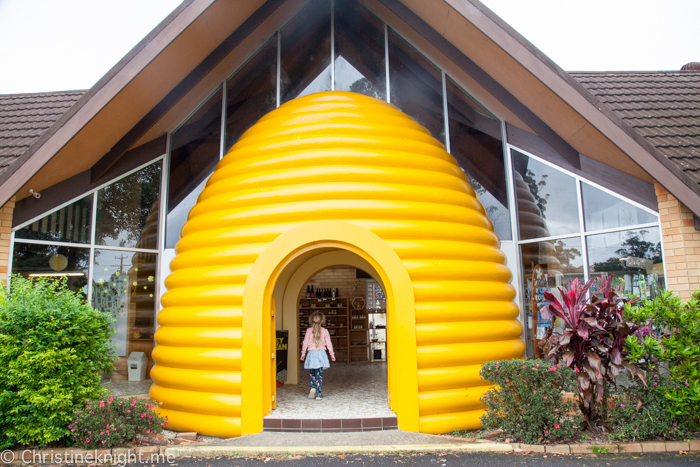 Get more info on visiting The Honey Place here. This 1km boardwalk starts in the town of Urunga, passes along the Kalang River to where it meets the Bellingen River and the ocean. There are stunning views over the entire length of the boardwalk on both sides up to the Great Diving Range and Nambucca Heads. An abundance of wildlife lives in the water and mangroves. We only saw a pelican but if you’re lucky you’ll see more! The entire boardwalk is wheelchair and stroller accessible. Coffs Harbour is 540 km (340 mi) north of Sydney, and 390 km (240 mi) south of Brisbane. 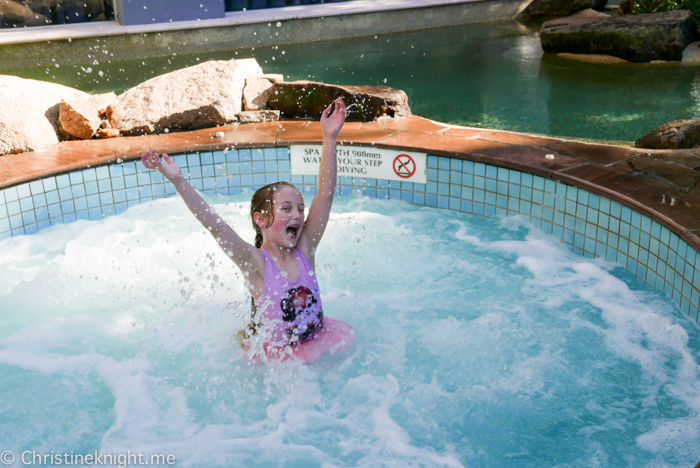 We stayed at the Big 4 Park Beach Holiday Park, right on Park Beach, Coffs Harbour. The Holiday Park has caravan and camping sites, as well as self-contained cabins. 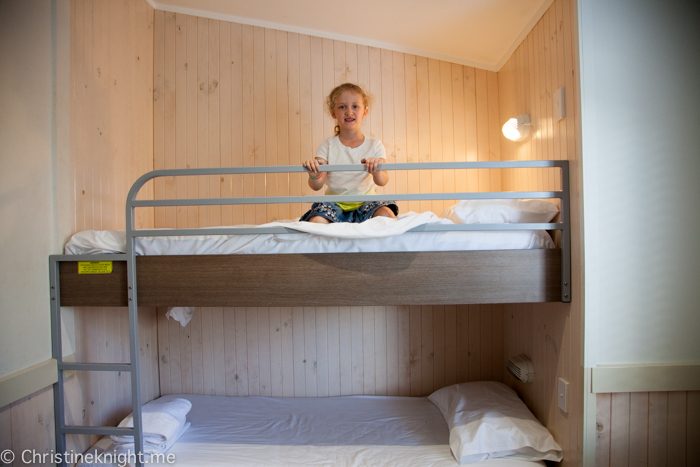 We stayed in a two bedroom cabin and were happy with having plenty of amenities at our fingertips, such as a full kitchen and seperate lounge/dining area. 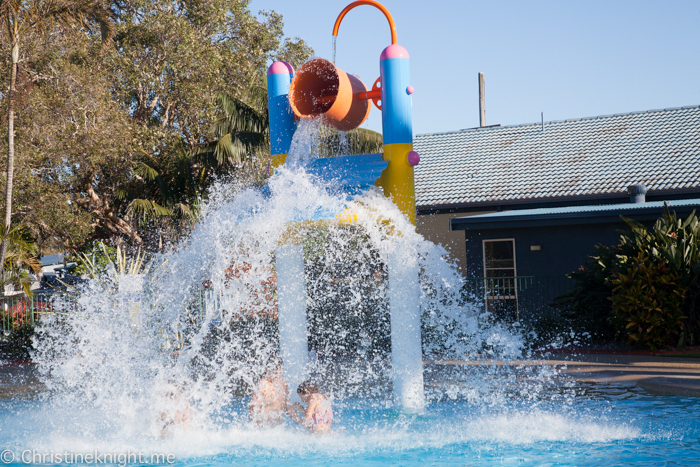 The holiday park has plenty to entertain the kids, including a resort-style pool with slides and splash features, and a large inflatable jumping pillow that would have entertained my six-year-old all day, ever day, forever. 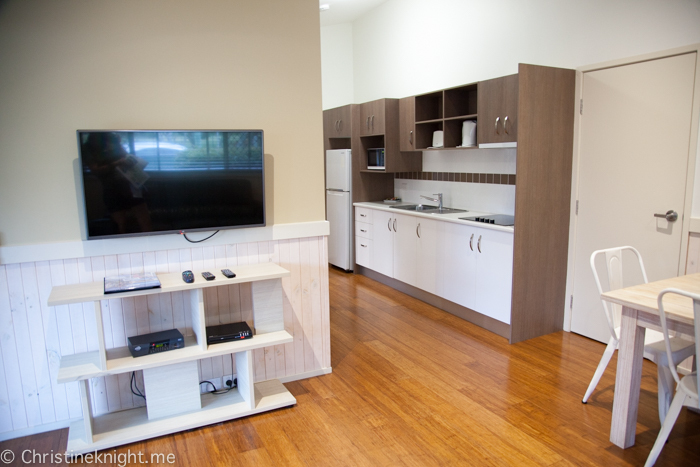 Other amenities at the Big 4 Park Beach Holiday Park include a kitchen and dining area for those camping, bathroom blocks and clean BBQs. The two playgrounds for big and small kids and games room are also popular for the junior set. 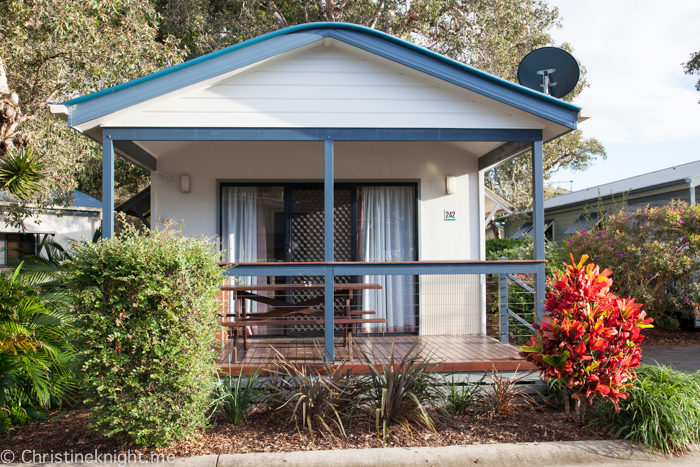 Get more info on the Big 4 Park Beach Holiday Park here. 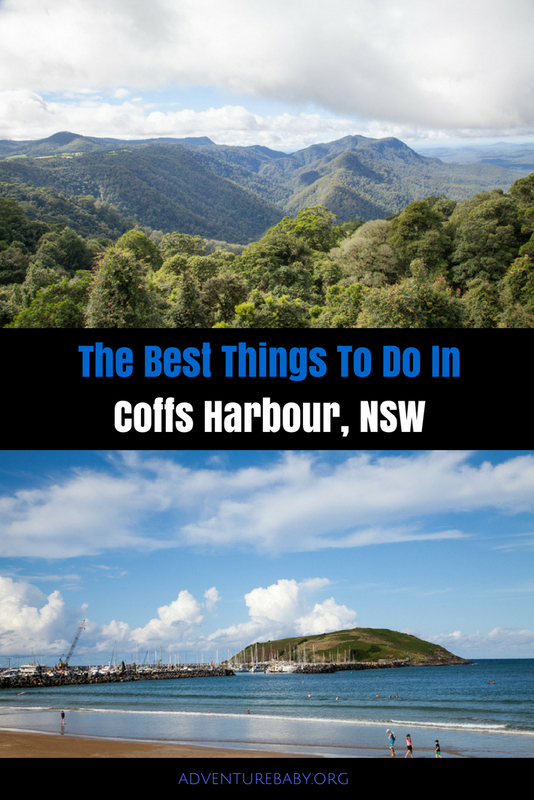 Looking for more things to do in Coffs Harbour? Heading down to Sydney? 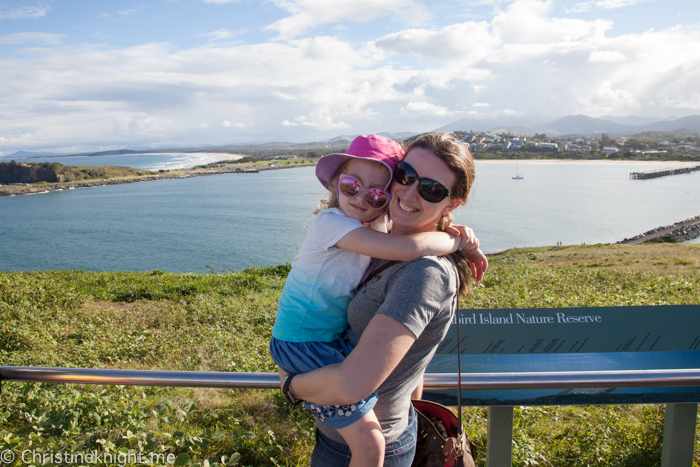 Check out things to do in Sydney with kids and the best free things to do in Sydney here.